Advantages: Well written and absorbing text, interesting photographs - many previously unpublished, excellent scale plans and competent colour profiles. Conclusion: This publication provides an indispensible guide to the huge “R” Class Zeppelins and is the perfect companion to Volume Two. The eagerly awaited second volume on Zeppelins has arrived and it doesn’t disappoint. This publication covers the “R” class ships which were introduced during the summer of 1916. These six-engined giants were larger improved types and were built over an 11 month period. All 17 are covered here which number from L30 to LZ 120. The large A4 format is ideally suited to this task. With over 76 packed pages, the author traces the careers of these “aerial cruisers” and does so with nearly 150 photographs, many previously unpublished. The images are most enlightening and reveal a great deal about the construction of these beasts. At least 30 of the images are in colour and these cover the details of preserved gondolas from around the world. The text is very well written and the level of interest created makes it hard to put the book down. 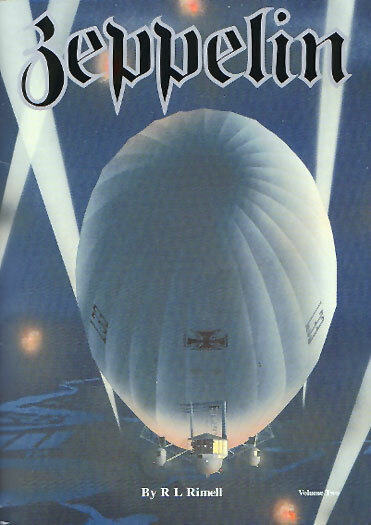 Accounts from various “airships” are related to the reader and we are able to get a wonderful insight into the trials and tribulations of the crew. For example, we understand how a village policeman captured the crew of L33 when it was brought down at Little Wigborough and the testing of wire-guided torpedoes by L35. The latter was also involved in trialing the revolutionary air-dropped airplane! Firsthand accounts also make an appearance and a graphic description of L45’s last night raid is described by its rudderman. A two-page spread of artwork gives the reader a colour perspective of these craft and are competently done by Ray Rimell himself. A discussion on the technical aspects of these machines can be found throughout the book with an amazing array of topics covered. Areas such as the internal wiring, gas cells, water ballast, fuel tanks and bomb compartments are all talked about in detail. Naturally the gondolas themselves are not forgotten, nor are the outer coverings, camouflage or markings. There is plenty more in store with flight characteristics, bracing, and control surfaces also coming under the spotlight. Yet another highlight is the detailed plans feature. There are 9 pages devoted to this and they cover the L33 “R” Class Zeppelin in 1:350 scale and the various gondolas in 1:96 scale. These come courtesy of Martin Digmayer and the work is up to his usual high standards. A handy “Spotter’s guide” rounds out the book and this covers the colours, visible hull markings, service notes and fate of each airship. The author is known for his love of the Zeppelin and in this publication it clearly shows. There is a lot of information packed between these soft card covers. Personal narratives, technical details, general arrangement drawings, colour artwork and more, all combine for an impressive overview of these giants of the air. It’s the perfect companion for Volume 1, and is indispensible to the airship enthusiast.